ACE’s Mentor Program connects our young people to volunteer mentor figures from the community and beyond. Mentorship is an important element of the ACE Model of Service. ACE is grounded in the fundamental belief that young people, when given the right assistance, tools and role models, they can transform their lives and their community. The Mentor Program is a critical tool to provide resources and support. A mentor is someone you can trust, who can guide and support you through YouthBuild and life. Mentors can help identify one’s strengths, how to make the most of them, and dealing with any challenges you might face at school, work, or in your personal life.ACE’s matching process is designed to establish and nurture relationships with individuals who are best suited for eachother’s company. Our Mentor Coordinator takes into account individuals’ personal interests, background, schedule, and goals for their future. 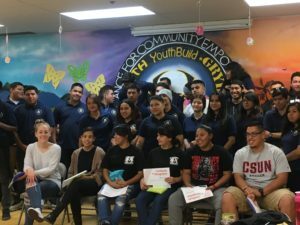 ACE’s Mentor Program has worked with California State University, Northridge’s MOSAIC (Mentoring to Overcome Struggles and Inspire Courage) Program and other passionate community members to create long-lasting relationships. Take a look at how our mentors work with our students!